As December approaches, try new bold flavors like spicy Thai ginger, beef with apricot preserves, and homemade curry powder. Shop at your Asian and farmers' markets for the best deals on produce and spices, and then get in the kitchen! The Vegetarian Yellow Curry and the Thai Coconut Soup are both perfect for a post-Thanksgiving detox, and beef tenderloin with apricot and olives, best served over a fluffy pile of steamed jasmine rice, will warm you up. I promise you'll have a full and happy tummy this week! You may need to take a field trip to your local Asian market to find some of the ingredients, but once you have everything, this soup comes together in a flash! 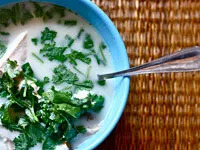 Bring the chicken stock to a simmer along with the lemongrass, galangal, and lime leaves. Blend in the lime juice and fish sauce, simmer again, and then add the chicken, minced pepper, mushrooms, and coconut milk. Continue simmering until the chicken has cooked through, about 15 to 20 minutes. Ladle into bowls and serve with cilantro on top. 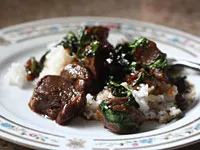 This is one of my absolute favorite beef dishes. I love the blend of sweet and savory! Brown the beef in the olive oil over medium to high heat. When it’s medium rare, remove from pan, set on a plate, and sprinkle with salt and pepper. Set aside. Add the minced garlic to the same pan you cooked the beef in. Cook for about 3 minutes and then add the vinegar to deglaze the pan, stirring well to scrape up any brown bits. Add the apricot preserves and cook for 4 minutes, until the sauce bubbles and thickens. Add the olives, beef, and spinach, and heat through, cooking for a few minutes until the spinach wilts and the beef is done. Hit your local farmers' market and warm up with this classic veggie curry. It's a favorite in my house! In a small saucepan over low to medium heat, toast the coriander, cumin seeds, and mustard seeds gently for about 4 minutes to release maximum flavor. After toasting, add the cayenne, salt, and turmeric, and set aside. In a large saucepot, combine the diced tomatoes, water, fresh ginger, and spice mixture. Simmer for 20 minutes. Meanwhile, sauté the vegetables. Heat the canola oil over medium heat in a large skillet, add the onion and sauté for about 6 minutes, or until the onion is soft and translucent. Add the garlic, fennel, carrot, and sweet potato. Cook for another 5 minutes. Stir often. Blanch the broccoli florets in boiling water for 30 seconds. They will turn bright green. Drain and rinse them under cold water. Set aside. Add the coconut milk to the tomato mixture and stir in the sautéed veggies, broccoli, and bell pepper. Raise heat to a boil, then reduce to a simmer for 30 minutes, or until the carrots and sweet potato are tender. Stir in the chickpeas. Serve curry on its own or with brown or jasmine rice. Cilantro is delicious on top!